Market Sentiment Watch: Expecting a quiet day in the market as thoughts turn to extended holidays. We've got a number of calls set with smaller caps today as we work to finish the final iteration of the Bakken Players update due out next week. In today's post please find the natural gas inventory slide show (record sized withdrawal for any week of year) and a number of other odds and ends. Third quarter GDP came in at 4.1% vs 3.7% expected and a prior reading of 3.6%. Crude oil rallied $0.98 to close at $99.04 on the February contract which takes over front month duty as of today. Crude is likely rising on Libya disruptions and positive sentiment following Ben's last speech yesterday. It climbed with the dollar yesterday which you often don't see. The front month now looks like this. This morning crude is trading up flat. Iran Watch: 6 party talks resumed yesterday and now the focus moves to implementation details. Meanwhile a group of 26 senators are promoting a new round of sanctions to go into place in 6 months should Iran not meet the terms of the new deal. Natural gas jumped $0.21 (5%) to close at $4.4.46 yesterday after EIA reported a much bigger than expected and record (in our database that goes back to 1994) withdrawal of 285 Bcf. The East Consuming region alone took 132 Bcf out of storage which was in line with the five year average for the whole country. Eastern gas in storage is now 11% below the 5 year average and the Marcellus names should be breathing a sigh of relief at this point. Note that the mild weather this week means next week's report will be a small one but we are now well into deficit territory to both year ago (that's not hard) and the five year average (not really saying much there either) and more importantly we're back levels we would have expected this time of year in the first half of last decade when production and demand were a lot lower than they are now. 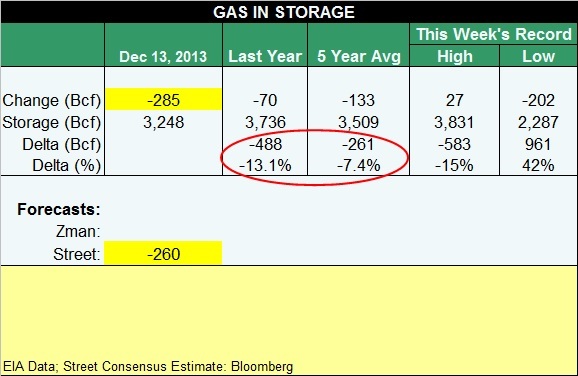 We continue to see the absolute level of gas in storage as price supportive and our sense is that the range for winter lows probably just got bumped up to $3.75 (during periods of extended mildness this winter) with highs in the $4.50 plus area (during bouts of bitter widespread cold). 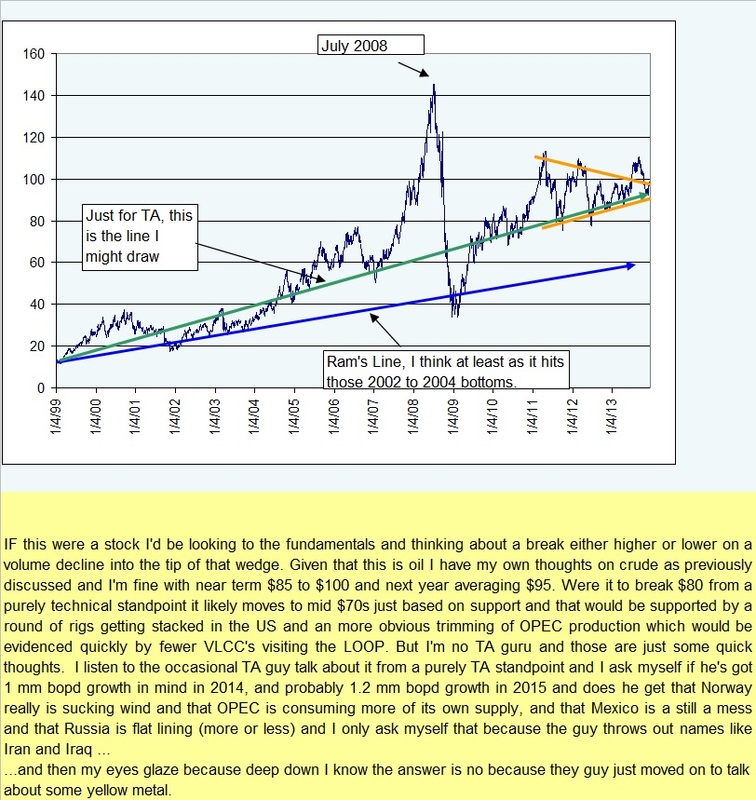 See the charts below for more details and note that the hypothetical spaghetti graph ranges all shifted down to some fairly friendly looking outcomes for gas bulls. This morning gas is trading flat. Marcellus Frac Watch: PA's supreme court struck down parts of the state's 2012 oil and gas law making it possible for municipalities to regulate fraccing. Delay in longwall startup at one of their met coal Australian mines (electrical, mechanical, and hydraulic) prompt $60 to $80 mm EBITDA miss for the full year 2013. We continue to own a sliver of BTU really to force us to continue to pay attention to the space. No plans to add at this time. Wild Speculation Watch: OEDV is sitting on prime, Logan County real estate, right next to Sundance. In fact, they are in some of the same wells on the border of the acreage. And Osage wants to transition to being an operator on its other acreage positions in OK but can't operate in Logan given the 3 way split there. Hmm. If only someone could come along and take them and their partners out of the non-operated position to fund their operated endeavors. That would be a truly transformative event. Nutshell: We continue to be encouraged by the workmanlike progress Sundance made over the last year since selling a non-operated position in the Bakken to QEP and adding a now growing piece of production in the Eagle Ford via cash and further share sales. We would expect further bolt on transactions in the future as they build out their core areas. Micro Permian player AZZEF confirmed a shareholder vote set to approve among other things the $300 mm sale of it's Permian position. This entry was posted on Friday, December 20th, 2013 at 8:34 am	and is filed under Uncategorized. You can follow any responses to this entry through the RSS 2.0 feed. You can leave a response, or trackback from your own site. 1) doesn't see a glut, pointed to current consumption vs current production, saying US doing better but still an importer … no real depth on his no glut answer there. 3) does not see natural gas market as being precursor to oil market in U.S.
4) is a supporter of Keystone – has been from start, press mischaracterized comments but also said we were a supporter 5 years ago, as long as it is going to carry Bakken crude but the delays caused us to find other ways to get barrels to market, both rail and other pipes. 5) does think we should export natural gas, mentioned 100 year supply. If I find the link to the interview I'll post but really a non-event, as expected type thing. reading … nice timing with the Sundance comments above. – they'll operate 5,015 of their of their now 9,490 net acre position along the Nemaha Ridge. Slawson will continue to operate the other 47% of the group's acreage. – will be talking to them today. re 4 – Should be an opportunity but would think it does little until they get the roadshow going and the deal priced. They have a good story to tell, will be interesting to see what they buy with some of the proceeds. Eli, saw your note this AM on MHR. Thought the IPs they shared on the Collins Pad in Tyler County were fantastic. The Ormet, not as great, but inline with projections as a unit. The Eureka Hunter pipeline continues to be a nuisance with regard to delays, hiccups, etc. Liquids drop out => Whacky stuff. I remember reading something about liquids causing a similar problem in EFS pipes a while back, but largely forgot the details. Hopefully they can get this issue permanently figured out. I figure it is part of the growing pains of the company. In any case, I have a call scheduled Monday morning with Gary and a VP of finance to talk about monetizing Eureka Hunter and the best ways to go about doing so. If you have any thoughts you would like me to convey, I'd be more than happy to do so. LLS jumps $5 yesterday. Bakken pricing back above $90. 6 Dedwards – MHR hearing buildout of pipe to ormet wells now expected late Feb with liquids handling equip installed by mid-March. re 7 – yeah, thanks, Bakkens have been talking notice. EFS names as well. OEDV – Adding a Trading position in OEDV, so far average cost $1.05. See today's comments section for late morning news of OEDV repositioning agreement in Logan County to operate just over half of their acreage. TPLM starting to lift with the other Bakkens. Call in an hour, notes to follow. Zman, the 25 year CL chart shows it breaking out of a base in 1999 and hitting a top in mid 2008. If you imagine a line drawn connecting the bottoms prior to that top, it seems that the previous uptrend hasn't been renewed (although it came close in early 2011). The last 24 months or so CL has been trading in somewhat of a flag formation and it appears to be converging into an apex in 2014. Is there a predictable break out of the apex based on previous chart history? SWN pushing the top of the now 9 month long base. Go to name for lightly hedged natural gas with growth in 2014. Go to name for Brown Dense in 2014. RE 14: SWN looks coiled. RRC similar. Will you have a map up soon showing what part you got, assuming it's pretty contiguous. Is it clustered are the Wolf area? Thank you RB. I always appreciate your inputs. Apologies for the delay, interns in the office today, tech malfunction, back to you Ram in one minute. Ram – please refresh browser and scroll up to the bottom of the post. Have added a chart for you on your question. re 21 – Right. Lack of operations update prior to year end is probably making some nervous. Where's Merlin they are probably asking. Thank you Zman. I just assumed if it breaks lower from the apex, it gravitates to that blue line. Not a guarantee, but if you wanted to hedge, I was looking for a presumed downside possibility. I haven't kept up with Sundance lately but is this getting very cheap for the co? I know from commentary out of Z and a few others they seem to be following their 5 year plan they set with years ago. Any thoughts are appreciated and TIA! RIG,DO-Citi taking a whack at off-shore, cut to sell. “The energy revolution has left our current export constraints obsolete,” Erik Milito, the director of upstream activities at the American Petroleum Institute says on conf. call. re 25 – cheap in my view, doing better in EFS than I expected. As they approach 5,000 BOEpd it will become painfully cheap. I'm a bit surprised by the size of the deal as they don't need the money now (unless it's to get enough float out there to be meaningful) or to buy something. May add on the deal, would like to see the IPO roadshow. Will be doing some fresh work on it. re 27 – right, of course. I did find it interesting the new Energy Secretary brought it up as in need of review. Don't know if you could get it through the Senate. TPLM quick thoughts in a bit. RE: 25 Sundance on the Australian Exchange traded about $8Million AUD today about 8 times its 3 month average volume. It touched a low of $0.88 AUD, down 16% from the previous day's close. SDCJF traded $13,500 yesterday. The Aussies seem a little upset about new stock issue. re 29 – same company, different ticker, no $50 fee for buying it. I think they have something they want to buy AND they want a more active US trading audience since they are growing in the the US. re 31 – fine with me. re sundance – I work with a company that does directional drilling for them in the EFS. Said they were told to gear up for 6 rigs next year. OEDV first because that's more pressing. They immediately become an operator, in Logan and not just in a smaller way in Pawnee. That in my book is a plus from a Street perspective. They have to operate. Not everyone is cut out to be an operator. Slawson is quite good at it in my view. OEDV is more of an unknown. That said these are not overly complex wells to drill or frac. The JV acreage goes into standstill mode for one year. Slawson will drill on it's acreage. OEDV will drill on it's. No capex to the JV (HBP'd sections) by either for a year. OEDV got the acreage to the south and south east. Not the Wolf area. They show on isopach this area to be thicker in the underlying Woodford. So they are think its the area they wanted. The first well will be a high interest Miss Lime test. Really high, probably upper 80%'s. These are gross cost $3.5 mm wells all in so they will drawn on their Apollo line to pay for this. Sounds like refinancing is going to get done after the first well is drilled. In my view, the risk reward got upped a level today. Both sides of that. This is good news in that they operate and CAN ramp production faster. It also puts a lot of burden on that first well. From a tactical perspective. They spud in early Feb and as such I'd expect a dip in production from 4Q to 1Q14 unless that one is a big well as it will have little contribution to 1Q14 volumes. I think they consolidated their eggs with this cashless transaction. I think if they were to have a mechanical issue or otherwise have a problem with the first two wells they'd have a big problem on their hands. Flipside would be the stock would be move pretty well off a successful well. I also think they have given up PUDs around some of the northern acreage and I don't have a way to quantify that but it may be part of not having done the refi yet. Risky name, could be quite strong, but only for the patient and it could get "whacked" should they have poor early operated program results. They have asked for a private call the week of Jan 6th and they will put out a new presentation shortly. re 34 – nice, thanks for the color. Crysball – ha, good timing on the email to them, LOL. Offtopicthirty – taking intern #1 to pre Christmas lunch. I'll be ignoring my phone. Back to the office around 2:45 EST. Thinking of re-shorting CRR – stock has gone up on new proppant they have which is the answer to everyones problem apparently and also probably on thoughts of NG drilling coming back. Well, any NG drilling that comes back that needs proppant to handles high pressures is likely to be short lived I think. (ex. Haynesville) Whatever increase in NG prices we see is going to be quickly met by increased rig activity in the Marcellus/Utica which will hold a lid on prices below economic thresholds for most other NG plays. So, here's the question: Do marcellus/Utica players use much, if any, ceramic coated proppant or are they strictly sand since pressure gradients are lower in those formations and dont require stronger proppants? re 39 – Marcellus is mostly white sand or RCS, Utica I'm not absolutely sure on but think its largely sand. Potentially 250,000bpd on rail out of Canada….quite the story for an old pipeliner…. The Edmonton Rail Terminal is currently being designed as a crude oil loading terminal capable of loading one to three unit trains per day totaling 100,000 barrels per day at startup, with the potential to expand to approximately 210,000 barrels per day, and ultimately to 250,000 barrels per day. The new rail terminal will be connected via pipeline to Kinder Morgans tank facility and will be capable of sourcing all crude streams handled by Kinder Morgan (KMI) for delivery by rail to North American markets and refineries. The rail terminal will be constructed and operated by Kinder Morgan and will connect to both Canadian National and Canadian Pacific mainlines. Construction is now underway and completion is scheduled for December 2014.
re 40 – Utica would be a little deeper than marcellus but not enough to justify really high strength proppants from what I know. That being said, I will need to do more research on CRR's new proppant and what they are claiming out of it before I go running my mouth. Everytime I have been to trade shows, I go talk to those guys and Momentive (another large proppant manufacturer) and they act like they have been waiting on NG prices to come back for their companies to really make a comeback. re 43 – yeah, makes sense for them to want to see the gas directed rig count lift. I don't have the data to support it but anecdotally it appears that what was a broad pie shape of ceramic 100% 2 years back in the Williston has contracted to a number of deeper area cores with much lower % ceramic use on the edges and sand used in the spaces in between. Just don't need it. WPX working on the post 3Q gap fill. REXX – no gap but same action off the low post 3Q. TPLM – starting to wake back up nicely. Had a good call with the CFO, nothing really new, shared usually gripes over Street coverage, "miss" etc. – They will go from 3 rigs now to 4 rigs next year, timing uncertain on when 4th arrives. – $100 mm EBITDA on 50% utilization was not a misquote, that's how they see it. Timing sounds to me like that's a 2015 calendar happening. – Montana would likely get its own rig for a small budget ($10 mm as per last presentation) set of vertical post holes to look at m Bakken, TFS but also conventional reservoirs. – Their G&G guys are very interested in studying a dolomite play at the bottom of the m Bakken, that will get wells this year. – Their second and third McKenzie TFS wells have been completed, results sound like Spring, no color, but they had some issues with the first one so it will be nice for a regular completion of a hitchlessly drilled and completed pair of wells in the that first bench of the TFS. Woah, did GST just announce something? re 49 – No. Strong day in the market and group. Beerthirty. Have a great weekend. Z – if you haven't disappeared yet…what do you show HK trading at for 2014 EBITDA multiple to TEV? I seem to remember it being around 4X but can't find your latest modeling at the moment in the dropdown menu. Quiet day indeed – Have a great weekend yourself. Thanks Zman. Have a great weekend as well. re 52 – a little over 5.5x on Street at the moment. Trading close to $100 K per flowing BOEpd on next year's average guided production. re 52 b – you too, I like the quiet myself. re 53 – thanks, you too. Headed out for last minute shopping. Drive around, consume lots of gasoline, buy stuff, support the economy, etc. OEDV, Z, I'm assuming this was the "transformational" event that he mentioned was upcoming when he blew off the conference call with us? Did he say anything about their credit line? Weren't they technically in default? Yes, this is the transformational event. They wanted to talk about the story in light of the change, not in light of how they could talk about it at the time our call was scheduled for. "Blew off" suggests they just didn't want to do it which is not the case. They thought they would have the deal done by the time of the second call and waited as long as possible to see if if would be but it was not so they cancelled. They plan to refinance or extend the facility after results of the first operated well. No, they are not in default. They are not in compliance with a production level related covenant with Apollo. That's a world away from being in default which would be not making debt service, which they are doing. 56: My pleasure, thought you be amused.